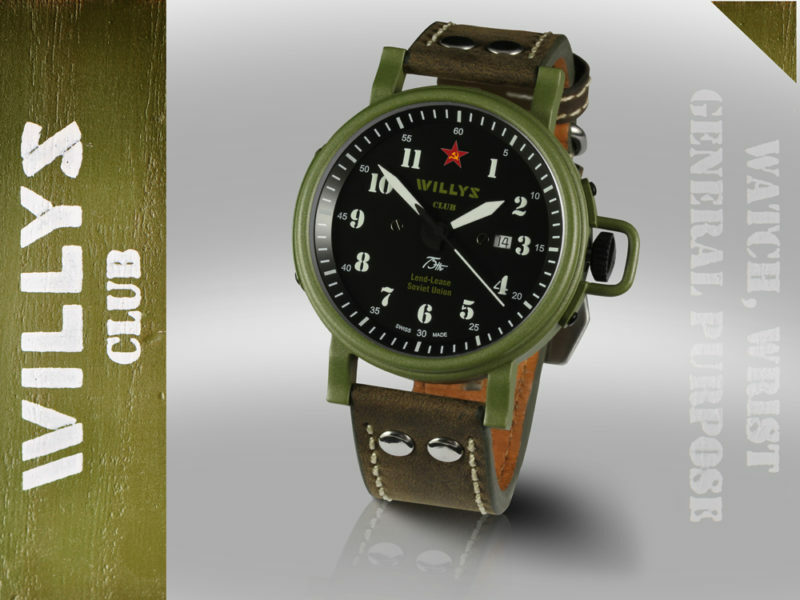 Willys Club collection automatic wrist watches are manufactured in Switzerland by the famous watch company Ronda and dedicated to the 75th anniversary of Lend-Lease. Every little detail of the watch is inspired by Willys Jeep and represents the legendary auto. The design of the case, dial and arrows of the watch repeats the distinctive details of Willys. 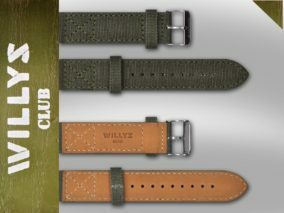 The watch is accompanied with two kinds of straps with Willys Club logo on top. One made of real leather and the second one is out of canvas material, styled to match the belts of the canvas awning top of the auto. The protection watch crown repeats the side handles of the legendary car body. The case back cover reminds of the fuel tank cap located under the driver’s seat; and the profile of the watch arches repeat the profile of Willys frame. The watch is created in four design versions with the appropriate symbol on the dial. The American version is in honor of the country of origin; the Soviet, British and Chinese are in honor of the countries with the greatest supply upon the Lend Lease Act. The watch of each country has its’ own serial number from 001 to 100, meaning that the watches are created in limited editions. More so, each number plate of the watch has the same screws as Willys number plates, and the classic Willys sign takes place on the face of the watch. The watches come in wooden boxes made in a military genre, marked in the Willys labeling style. These wooden boxes are packed in high quality carton to post the order, and that is also stamped with the logo of the Willys Club. The colour of the packaging reminds of the ammunition crate in which the Willys MB were supplied through Lend-Lease Act to Great Britan, the Soviet Union and China. Every watch is produced in industrial conditions; owns a factory catalog number, a certificate of origin and comes with a two years factory warranty. Willys Club collection automatic wrist watches’ are addressed to the owners and fans of the legendary Willys; admirers of the automotive technical aesthetics of 40’s; and as an attribute of belonging to the community or a club of owners of Willys cars.